The Digital Audio Label is the new generation in accessible prescription drug labeling. Press its button and hear a verbal description of the prescription details as prepared by the pharmacist. AccessaMED’s new online ordering offers you the opportunity to have the pharmacy prescription drug labeling experience in your own home. From Home Starter Kits to our customized prerecorded Digital Audio Labels, our online store provides a safe solution for everyone. 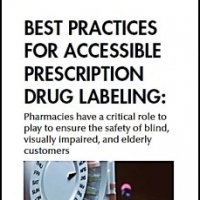 For the 21.5 million visually impaired Americans, not being able to read prescription labels can be a frightening reality. Not only does it limit independence, but can lead to taking the wrong medication or improper dosage, resulting in illness, an ER visit or death. The Digital Audio Label is the new generation in accessible labeling. Press the button and hear your audio message.